Construction students from the South Eastern Regional College (SERC) recently joined our Project joiner, David for a behind the scenes tour of Mount Stewart to gain an insight into the conservation work currently going on in the house. 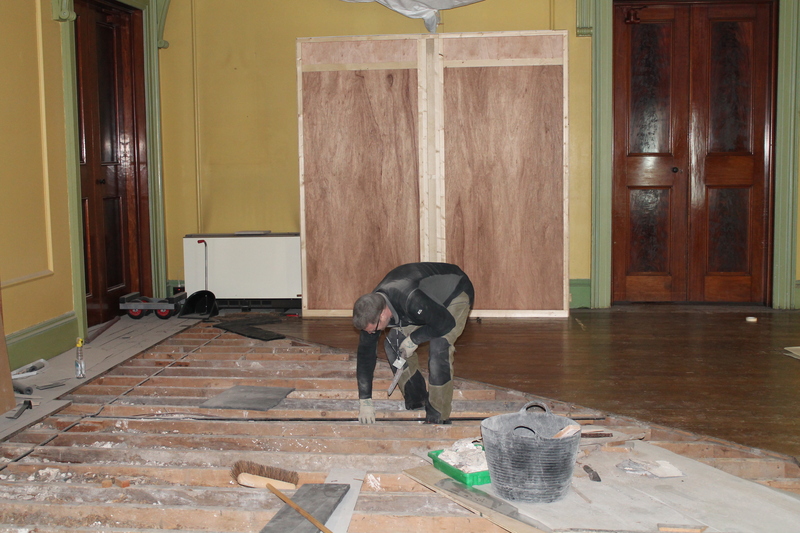 This time as the title suggests we are lifting the floor in the room called the Saloon. This room is a fantastic room; it is the room which in prior times held all the socialising the Vane Tempest Stewart family did. Just think, this room has had grace it the feet of Kings, Queens, Winston Churchill, Foreign dignitaries and myself! (Sorry I had to put that in). A thing also to remember is that the affairs of state and country would also have been discussed within its walls. 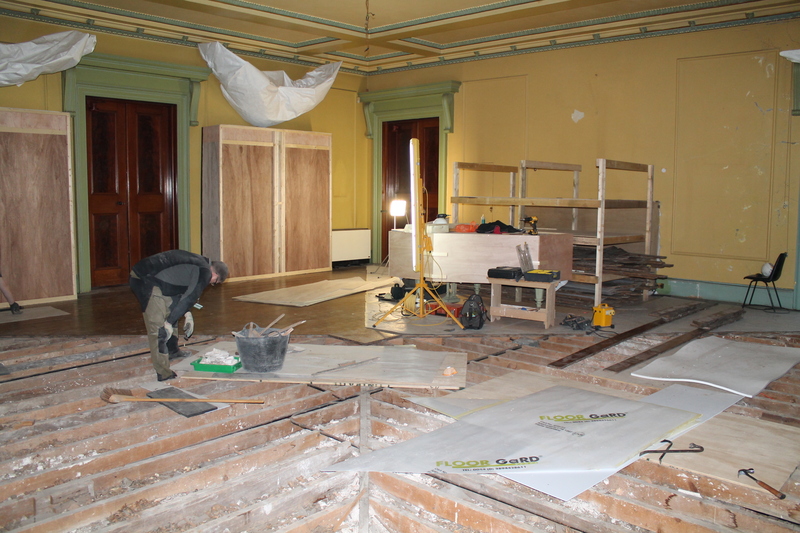 The reason we have to take this floor up is so that the contractors can fit insulation and also under floor heating. Structurally the room has not many issues other than its ceiling which has a crack running just above the chandelier. 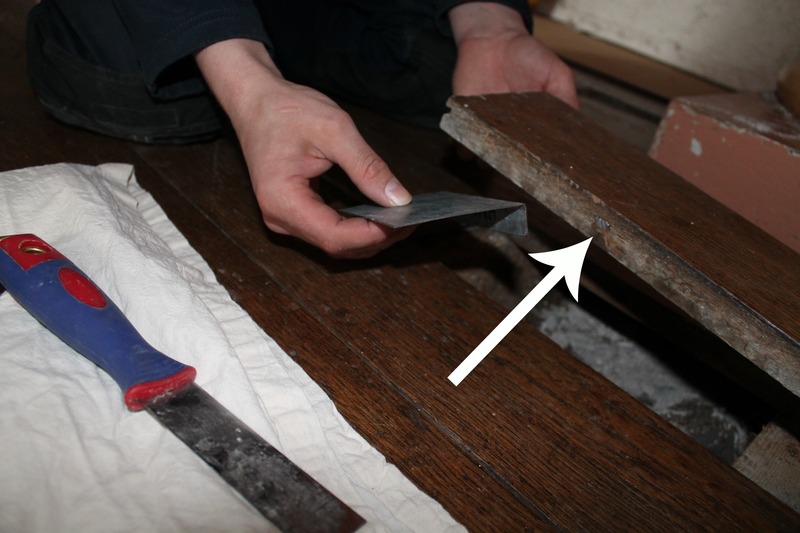 This crack has already been investigated, as this is a blog about the floor I will leave that subject for another time. 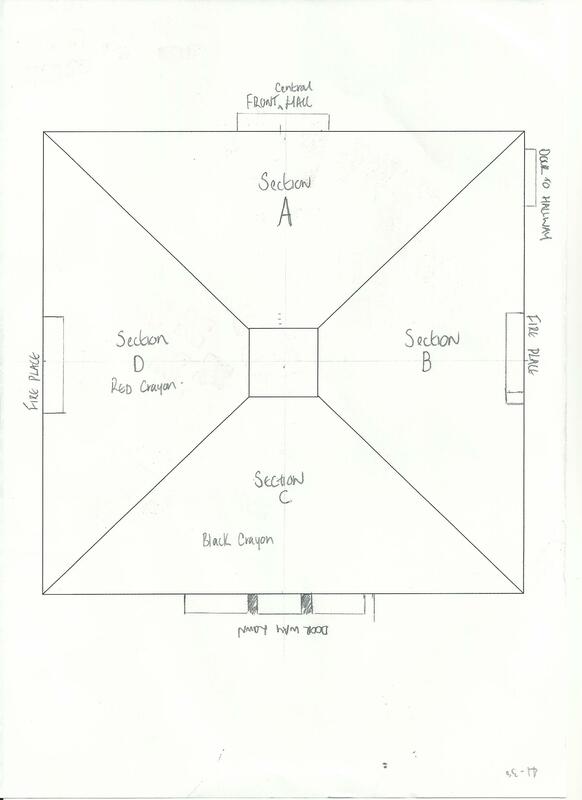 The floor is itself is a beautiful floor being laid in 4 sections which radiate from the centre of the room. 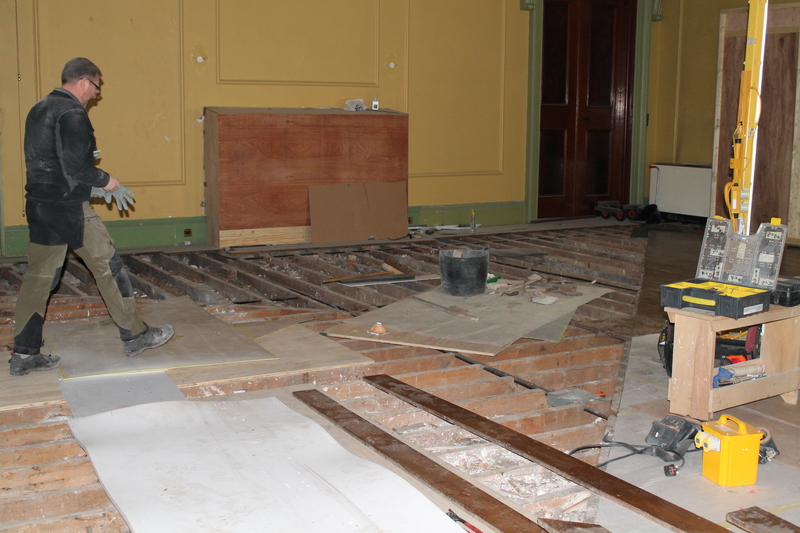 The floor boards are oak, but particularly quarter sawn. Oak that is quarter sawn is particularly beautiful due to the boards showing the medullary rays. We started the lifting the floor just after we came back from our holidays at Christmas time. I must admit I had some nervous moments just thinking about lifting it! Some of you who are joinery or DIY minded will be thinking this man is a big woose! But just wait until I show you why! The boards have a fixing every 6 inches, now that’s something else. 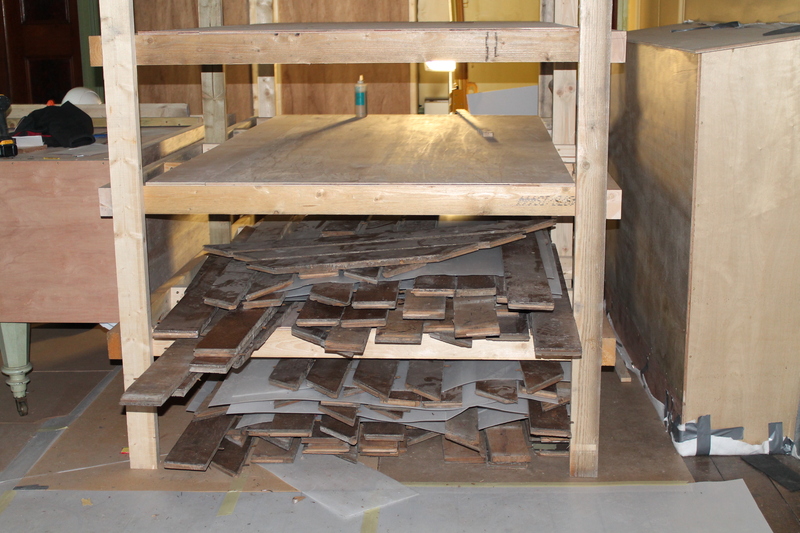 I was afraid that the pressure needed to separate the boards would be too much and thus damage the boards so badly that we would not be able to lift the floor without major intervention. Thankfully in the past some boards were removed to facilitate the fitting of electrical cables. 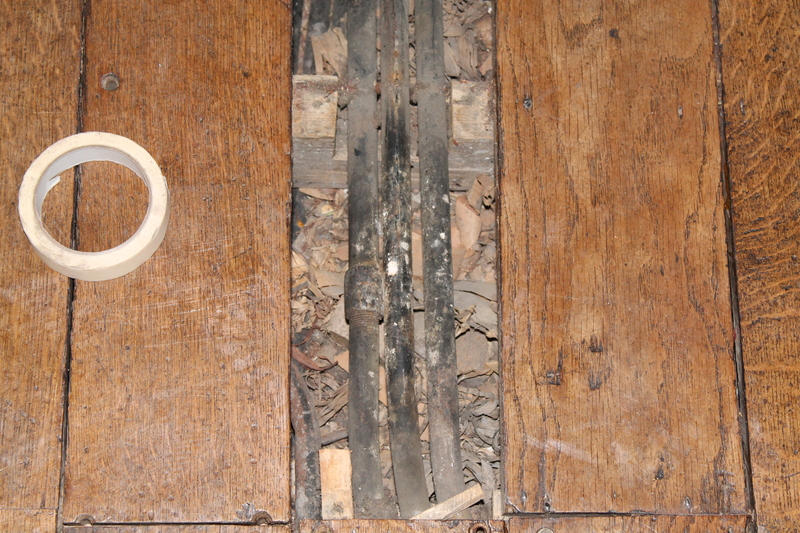 These electricians had done us a huge favour in that they provided a ‘way’ into the floor. Once we had a row of boards up it was just a matter of prizing them apart from each other. 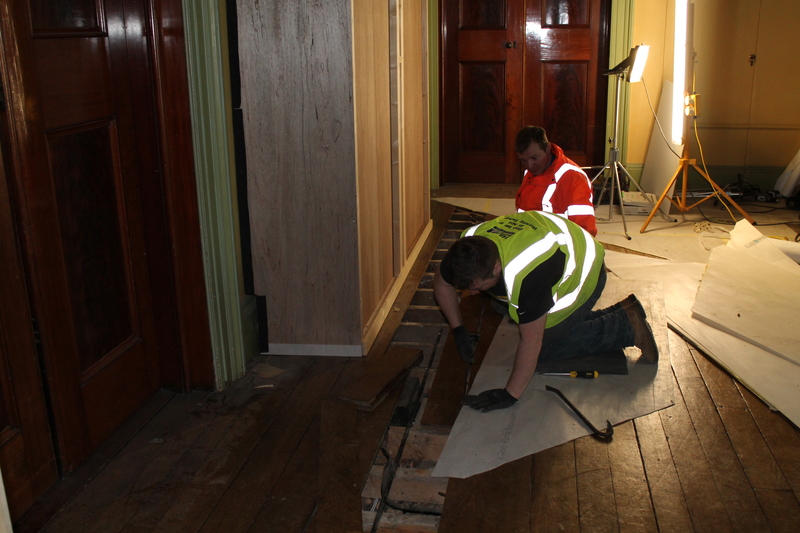 With things being so busy and the joinery team here operating on a never have a minute basis, H&J Martins were only too glad to lend a hand and give us two joiners to help us which in turn gave the two men experience in lifting this floor. So we all got stuck in! And we got half the floor up in 3 ½ days. Brilliant! 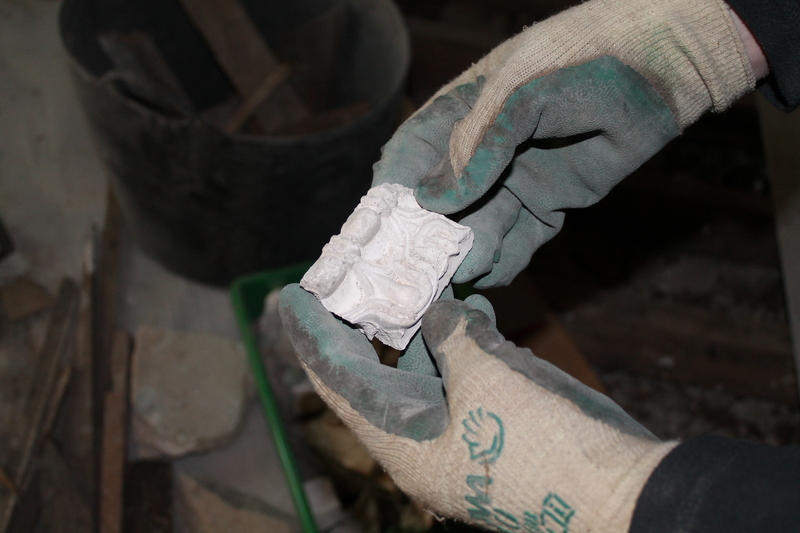 I remember Lady Rose jokingly mention to me some time ago when she spotted me lifting floor boards that, ‘If I ever find any jewellery or money which has dropped through the cracks, it still belongs to the family.” Needless to say I was very disappointed as I was going to operate under a finders keepers basis! 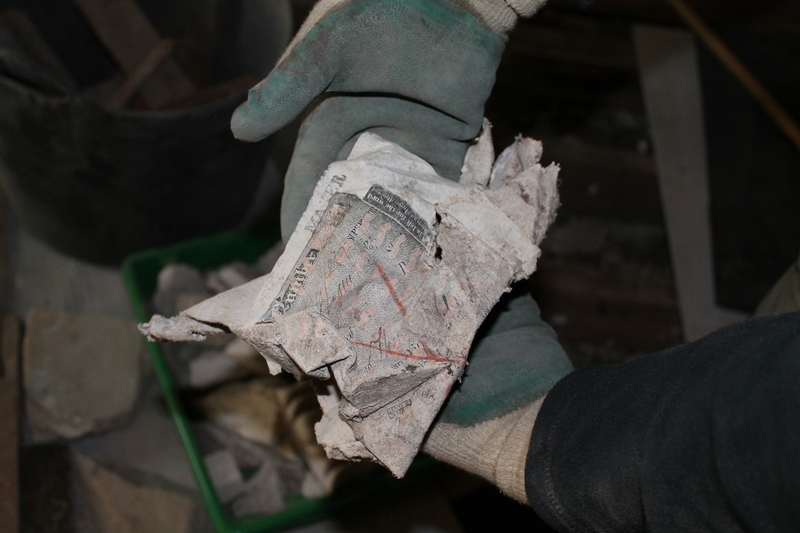 Very quickly we found some interesting things and found a massive sum of money! Twenty pence! 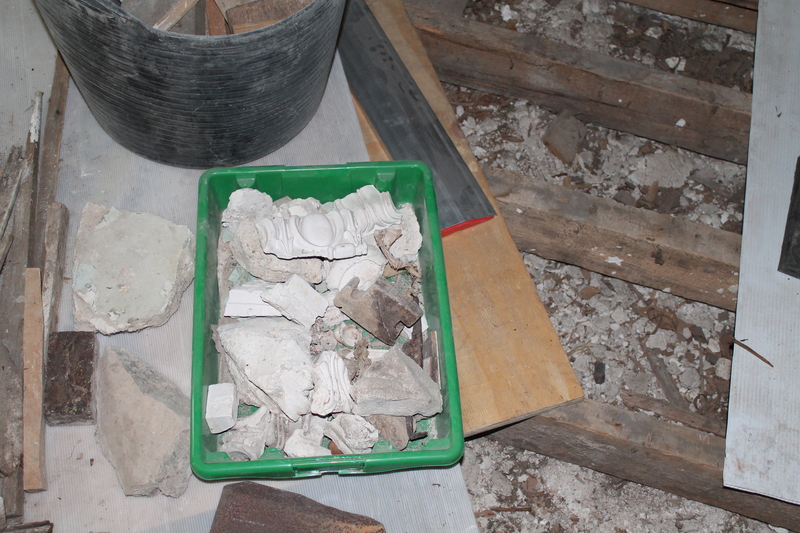 However we did find a very old shoe, mouldings which were fragments from the plaster moulding around the ceiling, sea shells and a dead mouse! 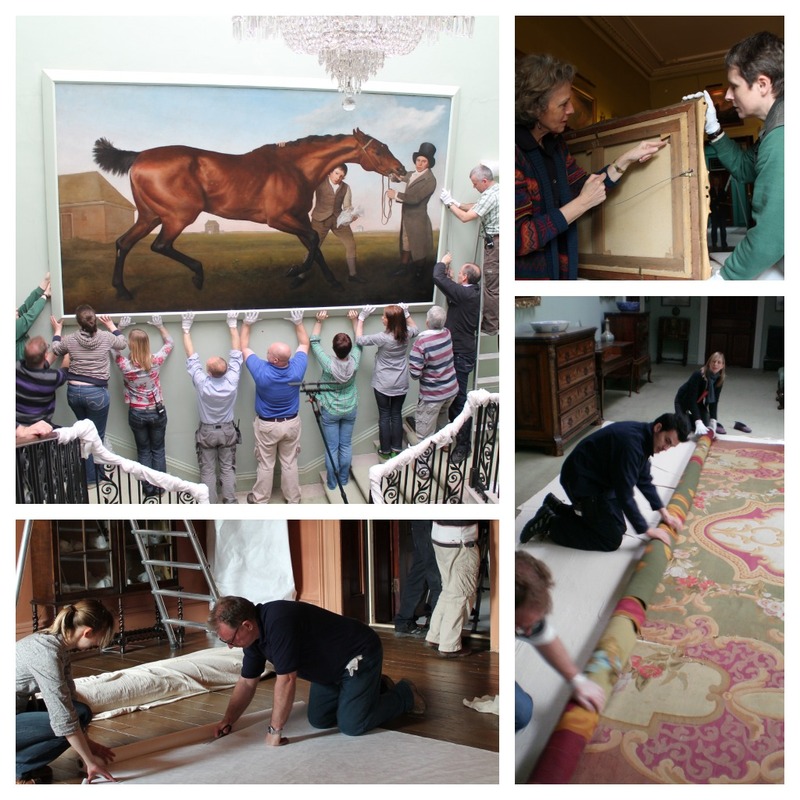 As this floor is a very historic floor we invited the National Trust’s archaeologist, the brilliant Malachy Conway, down to Mount Stewart. When one talks to Mal you can see very clearly he loves his job and is also very good at it too. So on seeing the floor his eyes lit up on seeing such a treasure trove of history and so began furiously to dig into the rubble. He quickly unearthed some artefacts and after an hour or so of fanatical archaeology, he had to be calmed down with a stiff drink of tea! We also had to build a rack for storing the boards until we lay them again. All the boards are numbered and kept in their rows. We had to stack them in the room because the room has the right atmosphere to keep the boards from taking on moisture. Well folks I will let you know when we have finished the floor and hopefully we will yet find something special.